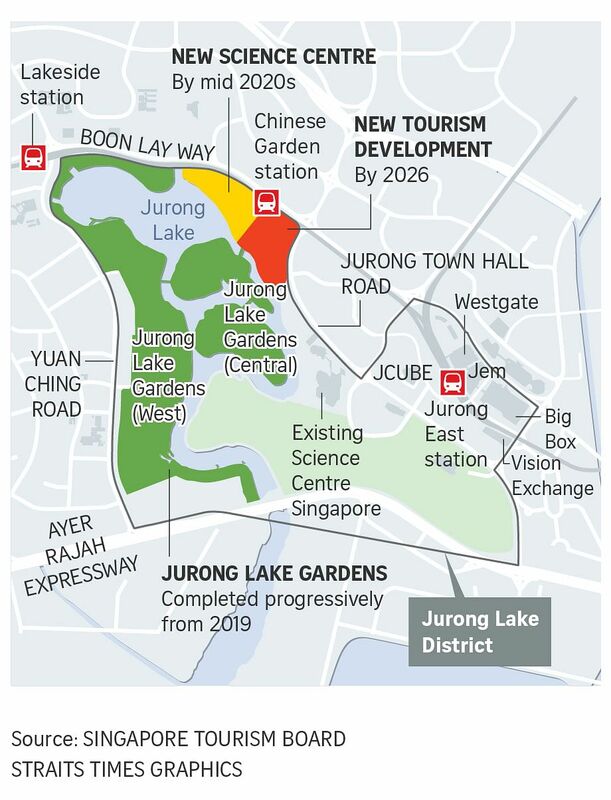 The up-and-coming Jurong Lake District will welcome a new 7ha integrated tourism development from 2026, a move that will bring large-scale leisure options to Singapore's heartland business district. The Singapore Tourism Board (STB) yesterday called for an expression of interest exercise for the development, which will feature a hotel, attractions, eateries and shops. The now-vacant plot of land, which is about the size of 10 football fields, sits adjacent to Chinese Garden MRT station and the site where a new Science Centre will be built in Jurong Lake Gardens East. Making the announcement at STB's annual tourism industry conference yesterday, Senior Minister of State for Trade and Industry Chee Hong Tat said that with its "unique waterfront environment and location... we envision this area to be transformed into a key attraction from 2026." The new development is in line with STB's strategy to spread out its tourism offerings across different parts of Singapore, he said, adding that the exercise will close in early November. The 360ha Jurong Lake District is positioned as Singapore's second central business district (CBD), and plans for the area include a commercial precinct, housing and expanded gardens. It is slated to host the Singapore terminus of the Kuala Lumpur-Singapore High-Speed Rail (HSR), and has been earmarked as a car-lite district. A spokesman for the Urban Redevelopment Authority (URA) said that the tourism development will complement the mixed-use nature of the district, where nearly half of the area has yet to be developed. The tourism development site, earmarked for an attraction in the URA's 2008 Master Plan, will be connected to the larger district by existing roads, park connector networks, cycling paths and footpaths, the URA said. Bus services and other transport modes will also help commuters to move seamlessly between developments within the district, it added. Speaking to reporters on the sidelines of the conference, STB chief executive Keith Tan said that while the tourism development will be integrated with the larger precinct, its concept will ultimately depend on the ideas that arise from the expression of interest exercise. Facilities for business events may also be part of plans, as more travellers who mix work with leisure are expected in the Western Business District. Mr Tan said the tourism appeal of the Jurong Lake area lies in the space it offers and the promise of the larger precinct. Tourists already make the trek out to far-flung attractions such as the Singapore Zoo in Mandai, he noted, adding: "If it is compelling and attractive enough, people will go." Many Singaporeans may have preconceived notions about the Jurong area, with words like "far away, industrial estate (and) inaccessible" coming to mind, he said. But the Jurong Lake District project aims to change this, with efforts by the Government to bring in more businesses and enhance connectivity with the rest of the island, said Mr Tan. Addressing the two-year deferment of the HSR project that would bring more visitors to the area, he said: "If it doesn't happen, we think there is still viability in the area. Our tourism projects are not dependent on whether the HSR comes about or not." Spreading out Singapore's attractions can also help to increase visitors' average length of stay from 3.4 days currently, said Mr Tan. "I think with the Jurong Lake District in particular, they will see not just a tourist precinct, not just where tourists go, but where locals go."